Just a quick note to tell you all that the distances and details of the ride can be found at the end of this post. This ride was definitely one of the heart and not the head. Who in their right mind would cycle 420km off their path in desolate countryside with unfriendly winds and undulating terrain for no reason at all? In our case the overriding reason was to see our mums, both of which live in Broken Hill. Let’s face it. Most of us would do extraordinary things for our mums and sitting on a bike for 5 days was the least we could do. 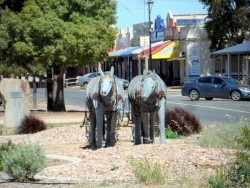 Early on in the planning stage of the trip we had decided to include a detour up to Broken Hill from Port Augusta. 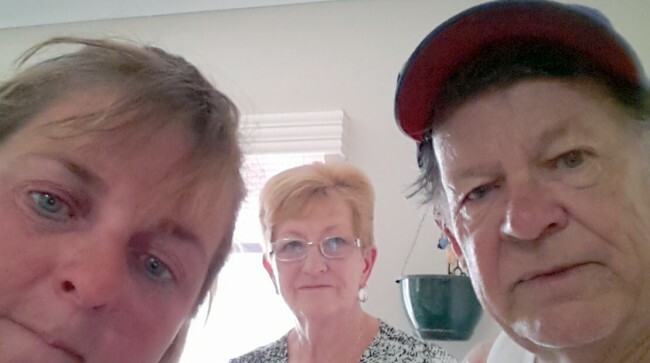 It was going to be a surprise for our mothers, both of who still lived in Broken Hill and we hadn’t seen for almost 2 years. 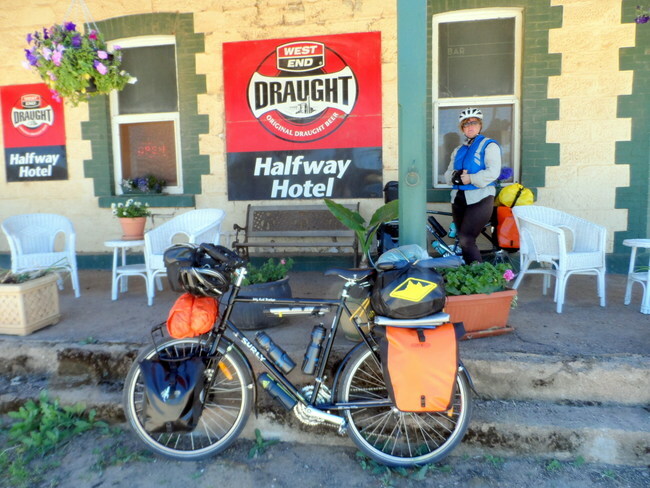 Apart from the 5 days we estimated it would take us to ride there, the only other angst we could anticipate was the ascent of Horrock’s Pass between Port Augusta and Wilmington. It’s a 5 km long, windy and narrow climb that would be a true test of our new found hill climbing abilities. As it turned out, the pass at the very beginning of our detour would be the least of our problems. www.weatherzone.com, had been uncannily accurate in predicting the weather for us so far and, much to our frustration, was predicting 5 days of strong north Easterlies – ie. headwinds!!! As usual, they were 100% correct. Dammit!! And so began one of the hardest stages of the trip so far. 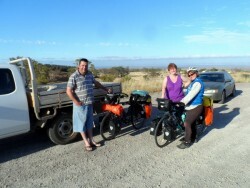 Day 2 from Orroroo to Yunta was perhaps the trips toughest day. 123km of really, really hard work. Long, undulating hills exposed to blustery winds that made us work hard on every revolution of the pedals. We were changing down gears and pedaling hard on the down hills! By the time we reached Peterborough we thought we were spent. Ordinarily we would have stayed for the night..BUT..if we were to make Broken Hill by lunch time on Thursday to see my sister Jenny before she left for Sydney we’d have to get back on the bikes and finish the job. Having driven the Barrier Highway many times (especially while Shazz was doing uni in Adelaide) I knew there were some hills of note but remembered nothing to be worried about. As any touring cyclist would know though, driving it in a car and cycling it are two different things. 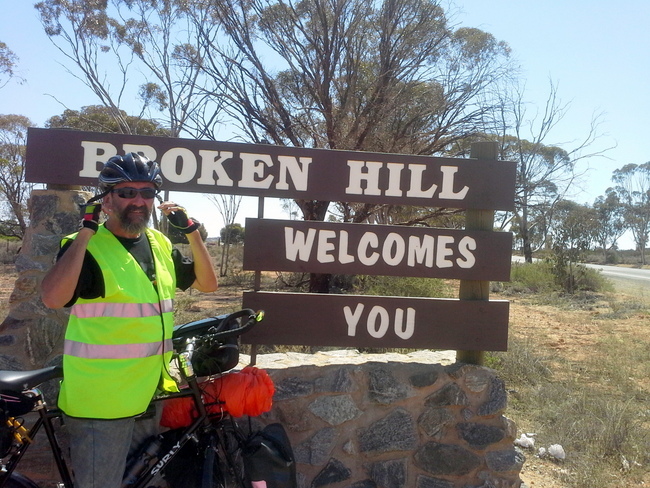 All the way from Adelaide (at sea level) to Broken Hill the road is ascending. There are very few substantial downhills and the headwinds robbed us of this lone luxury anyway. By the time we reached Oodlawirra we were shattered to find the roadhouse closed. Apparently it was now under new management and they had decided that Mondays was a bad day to trade – The Muppets!! Fancy not operating a roadhouse 7 days a week. We ventured next door to the pub. It looked closed too but in desperation for a cold drink we pushed at the door and it opened into an empty front bar. Fortunately the landlady heard us and came out and greeted us with a friendly smile. We ordered soft drinks and sat our weary arses at the bar. It was 60kms from here to Yunta and we’d need all the daylight hours left to make it. The wind greeted us at the front door as we left. We had 15km of ranges starting at Oodlawirra to get through and another 11km climb just before Yunta to keep us honest. I had never been so relieved to see a place as the afternoon we made it up to Jerramungup on our crossing from Albany to Esperance in Western Australia. It was with even greater relief to finally push into Yunta that evening just before dusk. A lone kangaroo jumped out and crossed the road in front of us as we entered the edge of town, a timely reminder of just how late in the day it was. As a just reward, befitting our efforts for the day, the pub was open and we took a room out the back. The ground was way too hard to bang in our aluminium tent pegs anyway! Peter and Debbie (the new publicans) were great and looked after us well. Debbie cooked us a wicked T-Bone steak that we just managed to stay awake long enough to eat. Thus continued our little country pub tour of the region, staying a night at the slightly dishevelled, but full of character, Olary Hotel and finishing off on the Wednesday night at the recently renovated and history laden Coburn Hotel in Cockburn on the South Australian/New South Wales border. On the Tuesday we had, once again, pedaled like hell from Yunta to make a 2pm deadline at Olary. It was Melbourne Cup day and we desperately wanted to see our horses run. In the end, all our efforts were in vain as neither of our horses won (Shazz did manage a 2nd place though). We did, however, run into the new owner, an old mate of mine from my teenage years in Broken Hill. Sam Mcleod had bought the pub 5 years earlier and kept the whole place running off a dodgy generator thumping away at the back. It was an absolute pleasure to sit with Sam, some friends, visitors and a team of shearers on the front verandah and watch the sun go down over the wide, flat expanse that stretched out in front of us with a few cold beers in hand. This was the real Australia that I’d rather show visitors, never to be encroached upon by the suburbs. Out here you need to be a survivor and the climate and the landscape forge characters straight out of a Boys Own Adventure tale. Everyone has a story to tell and a unique way to tell it. We were only too happy to share ours. 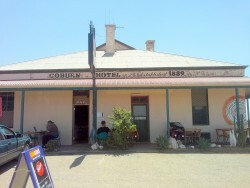 The very next night at the Coburn Hotel we knew exactly where to head – the front verandah. The owners, manager and one of the other locals (there’s 35 of them!!) joined us for a drink as we once again watched the sun do its thing at sunset. The next morning we cleared the Thackaringa Hills with little fuss and pushed the last 30kms into Broken Hill by midday. We made our entrance down Argent Street (the main street), back into traffic for the first time in 5 days and then made our way down to my mothers house. My sister Jenny made sure Mum would be home and a quick call before we arrived seen her greet us at the door and take us into see mum – she was gobsmacked!! (She thought we were on our way to Melbourne) We got a similar reaction when we pedaled over to Shazz’s mums place an hour or so later. It was great to be home to see our mothers and families and get to show them our bikes and tell them of our trip so far. They could never appreciate how difficult the last 5 days had been and the effort it took to get there but our 420km detour was just as much for us as it was for them. It’s always great to be home – for a visit anyway although it’s never long before we’re ready to move onto the next adventure. 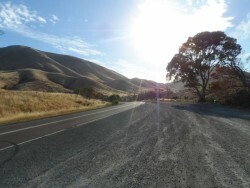 This time it will be a ride down through the Clare and Barossa Valleys to my old stomping ground in Adelaide. Port Augusta to Orroroo 91km (via old Wilmington Road). Tough climb through Horrock’s Pass and then some steady climbs through to Orroroo. Orroroo to Yunta. 123 km. Up to Peterborough, about 15kms of hills the other side of Oodlawirra and then an 11km gradual ascent starting approximately 23kms before Yunta then an 11 km gradual descent into town. Yunta to Olary – 81 km. back up out of Yunta and then a gradual down which feels pretty flat.